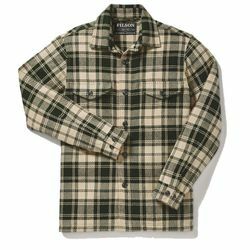 Filson Deer Island Jac-Shirt. The Deer Island Jac-Shirt makes a perfect heavy overshirt in cool temps, or a mid-layer in wet or cold weather. The heavy cotton twill is brushed for added comfort and warmth. Outfitted with side-seam handwarmer pockets and military-grade melamine buttons.